Below is a complete archive of all blog posts, pages, articles and websites by Dr. Linda Silbert. Are Writing Problems or Dysgraphia Frustrating Your Child? Dramatic Grade Improvement In 90 Days Or Less. Looking For A Reading Tutor? Struggling with Elementary, Middle School or High School Math? Thank you for visiting DrLindasBlog.com! What It’s Like To Work With Dr Linda Silbert and Strong Learning? Worried that your Child may be Struggling with a Learning Disability? Dr. Linda Silbert for telewebcasts and events. Our Educational Books a blog about what parents need to know. What is the difference between the SSAT and SHSAT Tests? How can I study for the SSAT to get a good score? What Do I Do If My Child Has Trouble Reading? 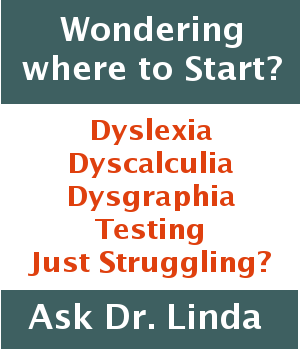 Dyslexia Online Test – What is real? Calculators in school – When is it OK? ADHD, Anxiety, or Auditory Processing Disorder?